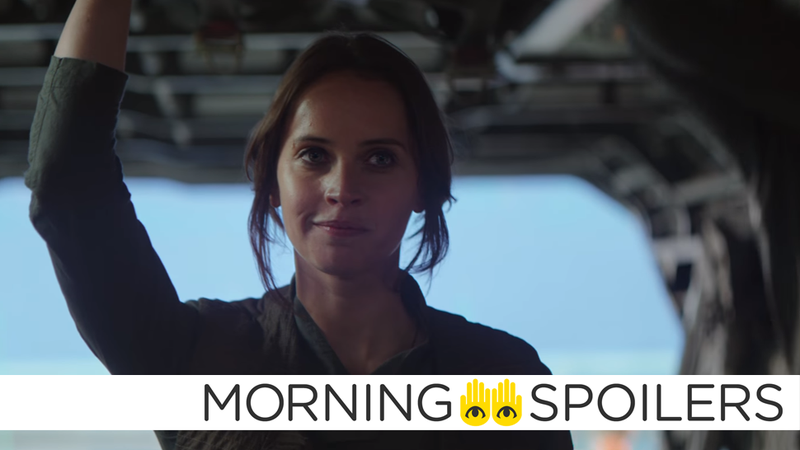 Which Two Star Wars Characters May Make a Strange Cameo in Rogue One? Find out what The Dark Tower movie takes from across the entire novel series. Gal Gadot talks about the values behind the Wonder Woman movie. Plus, Captain Power is coming back, and new looks at American Gods, Powerless, and Luke Cage. To me, my Spoilers! Fan site The Star Wars Post offers a rumor that Dr. Cornelius Evazan and Ponda Baba—a.k.a. those guys Luke bumps into in the Mos Eisley Cantina in A New Hope, only for Obi-Wan to casually slice Baba’s arm off—are in the movie, bolstered by a screengrab from the behind-the-scenes reel shown at Celebration Europe this weekend. That’s supposedly them in the background, unless you suddenly think Felicity Jones is playing an alien fishman. If the figures in the background are Evazan and Baba, then they are on Jedha during the events of the movie, presumably a very short time before their fateful encounter with Luke Skywalker in Mos Eisley. It’s likely a background easter egg rather than a major point in the film—but still, a weird callback to the original movie if true. The ending of the novels figures prominently in the beginning of this movie. Without spoiling very much, Roland has the Horn of Eld in his possession in the film, which is a signal that his journey is starting anew – and each turn of the wheel of Ka, or fate, rolls him to a new place even as it returns to the same position. I have thought about it, we’re working on it, and it’s too early to talk about it. It’s a story about a girl becoming a woman. I think only a woman, who has been a girl, can be able to tell the story in the right way. All my life I’ve been working with male directors which I’ve really enjoyed. And I’m lucky in that I’ve worked with men who have a lot of respect for women. But working with a woman is a different experience. It feels like the communication is different. We talk about emotions. With Patty, it’s a thing now, we communicate with our eyes. She doesn’t need to say a thing. If I’m hurt, she feels the pain. It’s a whole different connection that I have with her. She’s also brilliant, she’s bright, she’s fierce, she’s sharp. She knows exactly what she wants ‘Wonder Woman’ to be. Matt Damon only has 25 lines of dialogue in the whole film! ...a talented hypnotist teetering on the edge of madness. He arrives in Gotham with an unwavering desire to find his sister, Alice, a young woman who went missing in the city years ago. It is anyone’s guess just how far down the rabbit hole he’s willing to go in order to find her. Here’s the first look at Bilquis, played by Yetide Badaki. Finally, here’s some character posters for the show—more can be found here.